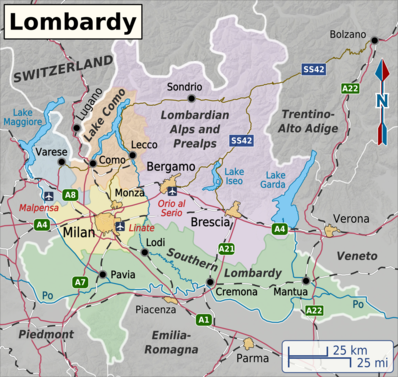 Lombardy or Lombardia is a northern region of Italy, and with 10 million people is the most populous one. Producing 1/5th of Italy's GDP, it is also the mightiest economically. Geographically, Lombardy encompasses both Alps and Prealps in the north, and relatively flat plains in the south along the river Po and its tributaries. Between them there are many scenic lakes, and the alpine backdrop makes even the low-lying cities picturesque and the air rather fresh. Lombardy is heavily industrialized, although most of the industry is actually not heavy, but rather mid-sized specialized machinery-building and other assembly and engineering firms, as well as consumer industries such as foodstuffs and apparel. The regional capital, Milan, is Italy's second-largest city and the foremost centre of commerce and a global fashion capital. Smaller cities also have considerable economic might, and have had so for many centuries, hence Lombardy is the region of Italy with the most UNESCO World Heritage sites - and simply, a lot of history and scenic views to explore and enjoy. 45.4641619.1903361 Milan (Milano, the capital of the province) – shares with Paris the title of fashion capital of the world, and is Italy's second city. 45.859.46 Lecco – a little and charming city situated on Como's lake. 45.15638888888910.7911111111117 Mantua (Italian: Mantova) – the Ducal Palace has a cycle of frescoes by Mantegna that no art lover should miss. The magnificent lakes of Lake Como - take boat trips in the shadow of the Alps to the picturesque villages of Bellagio, Varenna and Tremezzo - Lake Maggiore, Lake Garda and Lake Lugano. 46.007510.34752 Val Camonica : UNESCO heritage site, medieval towns, castles, holy art in churches, roman sanctuary and theatre/amphitheatre, ski sports. 44.99259.009173 Oltrepò Pavese : Wine region in the utmost southern part of Lombardy, 70km from Milan, part of the Pavia province, medieval towns, castles, panoramic views. The Longobardis occupied the Peninsula in the 6th century, and the territory has been named after them ever since. Lombardy is a prosperous region with fertile soil and a temperate climate. As in Piedmont, the Po Valley is the site of much heavy industry. High mountains in the north, marking Italy’s frontier with Switzerland, provide excellent skiing and climbing. Milano Malpensa Airport is an intercontinental airport, and Italy's second aviation hub after Rome Fiumicino. It has multiple direct connections to Africa, Asia and North America, as well as across Europe, where it is served by both full-service and low-fare carriers. Milano Linate is Milan's city airport, served by business-oriented flights to European major commercial centres, as well as a dense Italian domestic network. Bergamo Orio al Serio Airport is served almost exclusively by low-fare carriers, taking advantage of its proximity to both Milan and the Alps. Despite only Linate being in the city and province of Milan, all three airports are marketed as serving the city. One can easily get to other destinations in the province from them, without necessarily changing in Milan. There is also a small airport in Brescia, which in recent years has seen next to no scheduled traffic. Road and train links connect the region with Switzerland. As Switzerland is not part of the EU, there is a possibility that you will be delayed by checks at the border, although these are infrequent and usually not rigorous. Remember your passport. There is a relatively dense railway network connecting cities and towns in Lombardy, although the layout is intricate and getting from one place to another may not be straightforward. You should be able to reach your destination within 1 or 2 hours by train. Otherwise, buses and minibuses link important destinations, especially those popular with tourists. Hubs are usually in regional centres, as well as near major railway stations and airports; you can try to change there if there are no direct connections. Regional train network is entirely managed by Trenord. Regione Lombardia offers a good travel planner that lets you query the whole public transportation system. If you plan to travel a lot, it might be worth buying a io viaggio ovunque in Lombardia [dead link] pass ticket. Those tickets let you travel without limit on the entire public transport system in Lombardy, including regional trains, buses and city public transportation systems, but excluding some ferry boat lines. Although expensive, they can easily be a cheaper option than regular tickets if you travel long distances. Passes are sold at railway stations (at ticket box or automatic vending machines) and at ATM automatic vending machines. You can buy 1, 2, 3 or 7 day passes (16€, 27€, 32.5€, 43€ respectively - February 2015). The railway company Trenord offers some good travel packages, under the Trenord Free Time name. The package usually includes a ticket to an attraction or a trip proposal and a train ticket to get to the destination. Most of them are really useful only if you depart from Milan. It's worth to take a look at the offers as they can also suggest you some new or lesser known itinerary that you may like. As the Autostrada A4 runs across Lombardy, with the road system radiating from its junctions, you can get around by car as well. The A4 frequently gets congested though and traffic jams can be long and excruciating, especially around Milan. Be aware that Italians drive fast and make no allowances for foreigners, so be sure you are OK with keeping up with the traffic and occasional displays of impatience from other drivers. Milan, Bergamo and Brescia have efficient and extensive public transportation systems. Milan Fashion Weeks draw crowds of fashionistas to Milan every year. La Scala in Milan is a mecca for opera aficionados. You can enjoy water sports or more relaxed boating on the lakes. The Alps offer opportunities for hiking or skiing. Lombardy’s most famous culinary inventions are minestrone soup and osso buco (literally "ox knuckles"). To the west of Milan lie miles of rice fields, where the rice for risotto alla milanese is grown. Other typical dishes of the area include salumi (cold cuts) and polenta. As in many other areas of Northern Italy, the aperitivo (pre-meal drink with appetisers, for which a small supplement might be charged) is very popular. The wineries in Franciacorta, around Erbusco, produce many excellent wines. The region has been elevated to the status of DOCG (Denominazione di Origine Controllata e Garantita). Other remarkable zones for wine are Oltrepò Pavese (which is the zone around Pavia on the south banks of Po river) and the countrysides around Garda Lake. Valtellina also produces excellent wines, famous for their strong taste and flavour. As every big city in the world, Milan has also many high quality restaurants, wine bars and Enoteche (wine store) where you can find high class wines from all over the world. Large cities, like Milan, Bergamo or Brescia, are important business centres, so they have sizeable bases of business-oriented hotels. They are local hubs with connections to destinations within their provinces, and getting between them is also reasonably quick via a variety of means of transportation (trains, express buses or cars across the A4). Do note that accommodation in Milan is generally expensive, and prices skyrocket during major events or fairs, such as the Milan Fashion Week. Destinations along the lines of the lakes, as well as those in the Alps, are popular with tourists, so you will find a variety of accommodation options there, from luxurious resort hotels to simple B&Bs. While Milan features many of the usual tourist traps and con acts, as well as sizeable number of pickpockets due to the number of tourists there, other destinations are generally safe, and you can feel secure and welcome there. Do note, however, that in case you need to contact the police they can have very limited English skills and also may not be able to help foreigners much. To the east is Trentino-Alto Adige and Veneto, to the south is Emilia-Romagna and Piedmont is to the south and west. Switzerland lies to the north. This region travel guide to Lombardy is an outline and may need more content. It has a template, but there is not enough information present. If there are Cities and Other destinations listed, they may not all be at usable status or there may not be a valid regional structure and a "Get in" section describing all of the typical ways to get here. Please plunge forward and help it grow!